January 19th was our first wrecking trip of the year, a little earlier than previous years but the forecast was good so, off we went. After a bit of a steam for 2hrs 40mins we were at our first wreck full of expectation, but after four drifts with only 1 small Pollack to the boat it was time to move on,the next wreck totally blanked things at this point were not looking good so it was time to head off to a wreck that I keep as a back up if times are hard, another 40 minutes steaming…first drift saw a couple of nice pollack followed by a steady flow of plump Pollack for the rest of the day. At the end of the day we’d taken 41 Pollock in total, not a huge haul but with the way the had started I was more than happy with the result. So after our first trip in January I felt confident that there wouldn’t be to much of a problem finding the fish and that the wrecking season for us had begun, how wrong could I be? Storms as never seen before battering the channel had had a devastating effect on the wreck fishing, turning the water cloudy were it should be gin clear, that was the only common factor all the wrecking boats throughout the channel had in common (dirty water). Not a fish to be seen all day. As most of my fishing this time of year is wrecking the future wasn’t looking good, so with a set of small tides coming up I decided to cancel the wrecking and change to fishing on the deep water banks south of the Isle of Whight, 4 great days with a mixture of fish including 61 Blonde Rays all returned alive, we also had a couple of bonus Bass. Two weeks had past since our blank trip and I decide to give it another go, its not a cheap day to go wrecking, so to be fair to all onboard I explained our recent exploits to everyone and they all understood there were no guarantees that we would catch fish today, These are a great bunch of lads and it was decided if we don’t go we won’t know, so off we went again but this time instead of making it up as I go along I had a plan. Well the plan didn’t work so I went back to winging it and finally found some fish, just the odd one or two to start with as the tide was running and then bingo it went crazy for about an hour either side of the slack water with fish flying in, this was to be the pattern for the next few days good fishing either side of the slack, nothing on the full run of tide (very Strange). This week end 22nd March has been cancelled due to bad weather, hopefully another week or so will help everything settle down out there. A close look at the weather showed a small window where the wind may ease for a few hours but increasing throughout the day from the southwest, with Valkyrie being situated on the eastern side of the Isle of White, and the tide flooding for most of the day, this would be in our favour for a few hours at least. The wind would ease, not for long, but just enough to maybe allow us to try our luck for a Cod. We left Northney Marina at 07.30 with a crew of eight eager anglers all up for the challenge. Within the hour we had reached our favourite Cod mark, the tide was running a little hard as the flood was well underway so 1lb 8oz leads was needed to trot the baits back in the tide. The first hour or so was very quiet with only the odd Pout being caught, I thought when the tide started to cut back we would be into the fish, at the very least a load of Whiting. As it turned out the Whiting didn’t come on as expected, as the morning went on the fishing resulted in a steady flow of Pout and Dogs. The the call for the net went out and it was game on for Christopher, a young man who had came along with his Dad for a day out, he was attached to a good fish with his rod bent over double. After a short while Christopher had the fish under control and up popped a plump winter Pollack, not the Cod we had hoped for but a very welcome fish never the less. The bonus Pollock had given all the anglers a bit of encouragement and it wasn’t long before a few more fish were being landed, a couple of Rays, more pout, then we boated our first Cod of the day. The wind as predicted was increasing steadily by lunchtime and with the tide on the turn it was starting to get a bit untidy, now we had wind over tide, not too nice but we managed to stay put for the first hour of the ebb tide. This proved to be a good move for Keith as it was now his turn for some action, after a 10 minute struggle playing his fish up around the bow and under the anchor warp Keith finally landed a very nice Cod of about 15lb. With so much unsettled weather of late it was to much of a temptation not to go fishing today, 26th November saw a break in the weather but unfortunately I never had a booking (typical) As the days fishing unfolded, it turn out to be one of the best days for me ever. I’ve been married for 30 years to Jacqui and knowing her dislike for the boat, it took a fare amount of persuading for her to come out with me for a day afloat on Valkyrie. A reluctant Jacqui boarded for a days fishing and we were soon steaming away from Northney Marina in a south west direction for roughly 9 miles, would this be our hot spot? It wasn’t long before we set the anchor just to the west of the Nab Tower and baited up 4 rods, it wasn’t long before the first tell tale sign of the Whiting banging on our Cod baits. 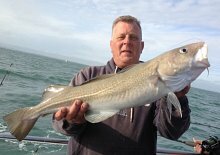 We’ve had some brilliant Whiting fishing so far this season, some of the best for a number of years with plenty of fish over 3lb being taken on most days. 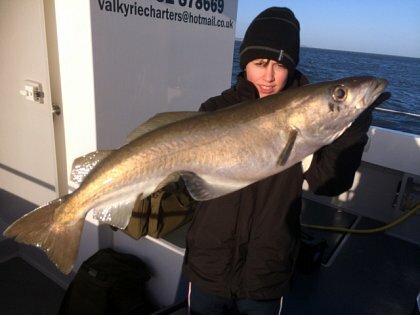 The first two hours today was no different with a steady flow of whiting being caught on the Cod baits. 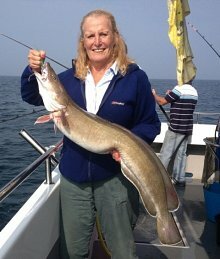 Just after the 2 hour point, there it was, the bite we have waited for, massive thump on Jacqui’s rod tip, was this the fish I’ve wanted her to catch so badly? She lifted the rod from the holder and it was game on, heavy fish staying deep and close to the boat. With a tell tale classic nod on the rod I was sure it was a Cod, and a good one at that. Like a seasoned angler, with the clutch set just right and her technique practiced to perfection she gently played the fish to the waiting net. It wasn’t until I placed the fish on the deck that we realised just how big the Cod was. All 24lb of prime fish, hopefully Jacqui has caught the fishing bug and we can go again. 20lb Cod on Whiting Gear! 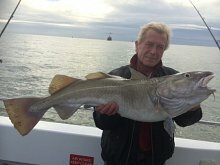 Finally the weather breaks and we’re off, after a week tied to the mooring it was lovely to be able to get out and have a look for some Cod, Image right is Mick with the best fish of the day a Cod just tipping the scales at 20 lb. 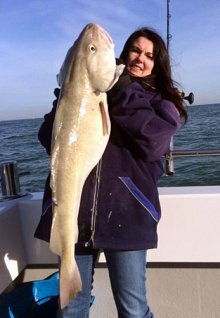 Now you just never know what will take your bait, and if you’ve read my Cod page on tips how to catch a big Cod in Winter, then big baits are highly recommend . . . Well no one told this lunker that and Mick gingerly landed on his Whiting Gear. Using a 2/0 hook and a small strip of Mackerel, needless to say his clutch was set very light and it was a tense time from when the fish broke the surface to finally getting it into to the net. Well done Mick, good skills. The rest of the morning saw a steady flow of fish coming over the gunnel, a few Congers, which can be a bit of a pain, Rays, Smouth Hound, some very nice Whiting and the usual Dogs & Pout to keep this tips rattling and nodding. 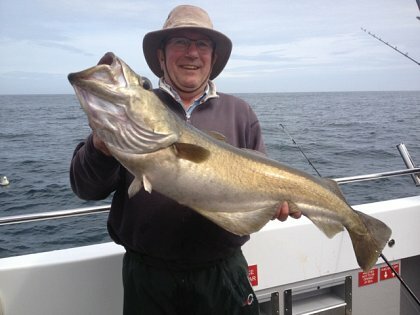 Why not book your next Cod trip now, I think the fishing will be great throughout November & into December. Places are filling up quickly. Getting a few Cod now! Managed to take advantage in a break from the Strong S & S/W winds that have kept us in so far this week. Small Cod on Cuttle baits seemed to be the order of the day as the Bigger fish failed to show. However, the fish we did take were all nice clean fish and the anglers when home happy with a few bites, and a some fish in the box. Signs are good and hopefully the weather and the fishing will be good this weekend. Wet and Windy conditions in the first half of this week resulted in blown off Charters but hope remains for a Trip later in the week if the forecast remains true. There’s plenty of fish about for those willing to work for them. 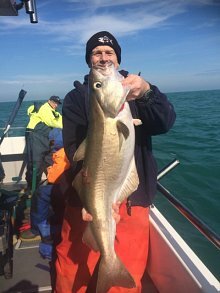 Rays, Bass, the odd Cod and Whiting starting to show in keeping with the early season. We’ve always the chance to try for Sole inshore with now a great time to bag a specimen. We also hope to get down to some serious Cod fishing when this blow settles down, hoping the fishing will be good when we finally get out. Fingers Crossed. Report Submitted on CBUK, Why not add your report? Great day on Valkyrie7 with Glen on the wheel. At the first wreck a steady catch rate of Pollack falling to brighter coloured sidewinders and shads. The last of the ebb tide we tried hard for a cod or two but just came up with Pollack 6lb to 10lb. Having had some practice even the less able where catching. Glen then moved us to a small wreck again looking for cod but this wreck was also full of Pollack. With a few fish pushing 12lb it was time to move on again looking for cod. We hoped to find some Mackerel for bait but these were absent the fish were coughing up a mixture of Spratt, Herring and cuttlefish. Conditions became brighter and the lure colours with yellow and orange worked best. Glen tried a third wreck this finally produce 3 cod two too hopping with twin tails and 1 to feathers. There was a bonus bass and a ling. The fish were feeding high in the water up to 60 turns up which was good as with slow retrieve and a bit of care some went back for another day. We ended up with about 20 fish per rod with 12 fishing. I switched to using 8” lures trying to find a bigger fish and was rewarded with one of 14lb, the best until a 15lb fish surfaced. Valkyrie 7 had plenty of room for 12 and is very dry and stable even at 18 knotts. There was a swell and steady chop on the sea but unlike most cats does not lift up in bows but remains level cutting through rather than over the sea. The tea making is good with constant hot water from the water boiler. Highly recommened for a great day out! 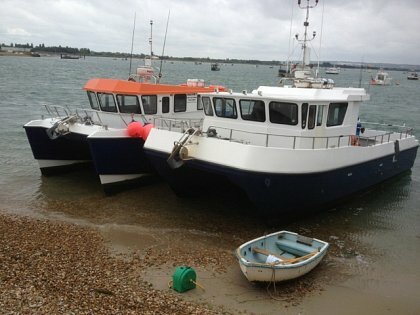 At seven o’clock with ten members aboard and we headed out to the banks to try for a few mackerel. The north side of the bank produced a few mackerel for bait, as did the south side but we only ended up with a dozen or so. The next stop was a small wreck well inside french waters where we were soon into good sized pollack on sidewinders and storms of various colours. After a few drifts that just produced pollack and the occasional pout the activity seemed to stir the ling into action as well so we tried using baits. The ling proved to be unfussy, as besides artificials, they took fresh and frozen mackerel as well as cuttle and squid. Not wanting to take too much from one wreck we then went off to a larger one a few miles away where we had more pollack and ling and lost a lot of lures bravely trying for cod (unsuccessfully). The fourth stop was just a couple of drifts over another wreck which also had pollack and ling and then we headed back toward Hayling. A flat sea, little wind, a bit of sun and everybody had ling (up to 22lb) and most had pollack (up to 15lb) to take home.